Scotland is well known for its dramatic landscapes and strong traditions. The scenery is breathtaking and with so many beautiful walks to be explored it can make a brilliant dog friendly holiday destination. When you think of Scotland you automatically think of the traditional castles and Lochs which Scotland is famous for. To take in a taste of the classic Scottish landscape you can visit Ben Nevis and then travel down towards Glasgow. 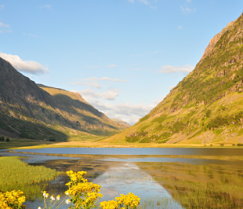 On route you can take in Loch Linnhe, The Trossach National Park, Glencoe, and Loch Lomond. Even in the pouring rain this makes a spectacular drive and tempts you with many walks along the way. Scotland boasts many traditional castles, for those of you that are keen to visit as many as possible there is a castle trail in Aberdeenshire which helps you to take in up to 17 castles and stately homes. One of our favourite castles is Glamis Castle (which was the childhood home of the Queen Mother) and Culzean Castle and Country Park where dogs on leads are welcome in the grounds. 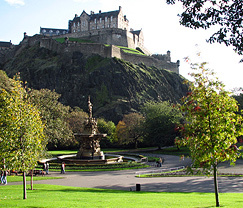 Edinburgh is often the first stop people make to Scotland and it’s no wonder as it has so much to offer from fantastic restaurants, top rated tourist attractions to the beautiful countryside close by. To take in the landscape of Edinburgh you can take your dog for a walk along the Salisbury Crags or up to the top of Arthur’s seat, from these vantage spots you can look back over the whole of Edinburgh and enjoy the peace and quiet of being away from the hustle and bustle of the City. Edinburgh Castle is a top tourist attraction but unfortunately not a dog friendly one so if you would prefer to take your dog with you to visit a classic Scottish Castle Craigmillar Castle, three miles outside Edinburgh may suit you better. 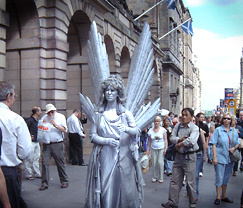 Scotland is renowned for its New Year festivities and there are many many events held over New Year. The largest is held in Edinburgh where there is a huge street party, concert, torchlight procession and fireworks display. For those of you that really want to get into the festivities then you can do a sobering swim in the River Forth on the 1st January. If you’d prefer a warmer celebration the Edinburgh Festivals held in August each year might be more appealing. The Military Tattoo, Fringe and Arts Festival are all held throughout August and ensure that there is something for everyone to enjoy but accommodation does get booked up quickly during this time so it pays to book up early.